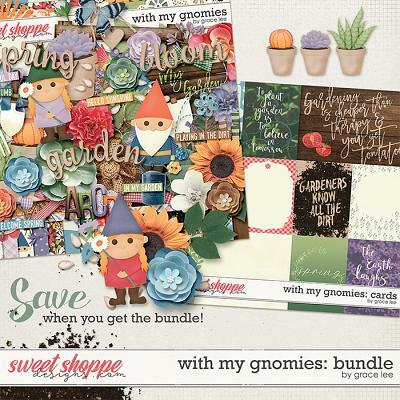 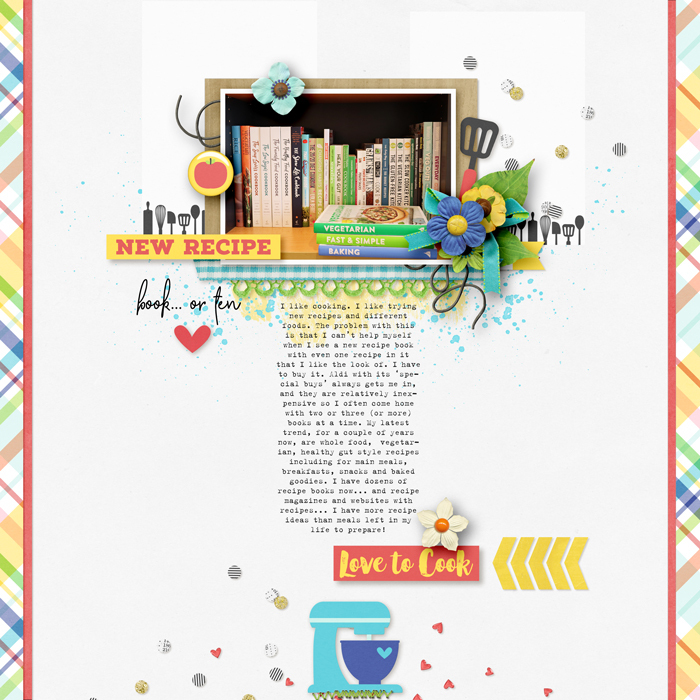 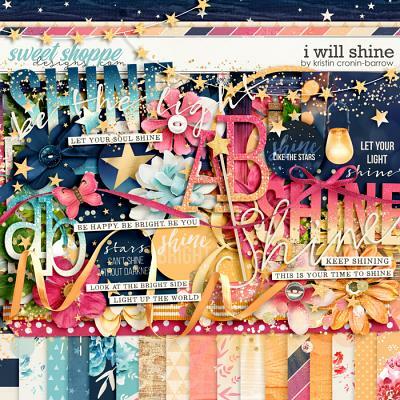 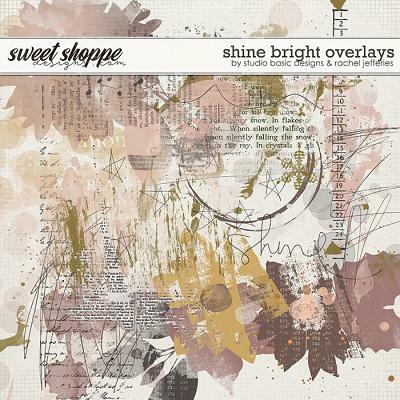 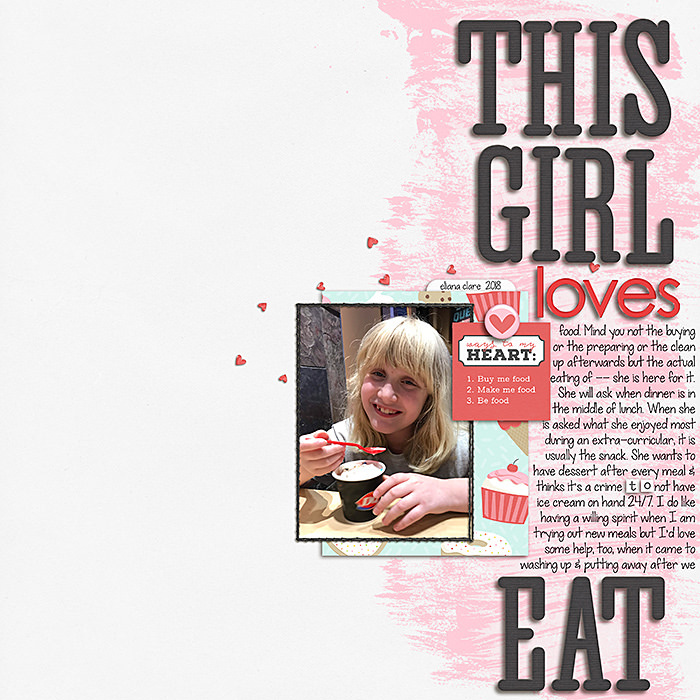 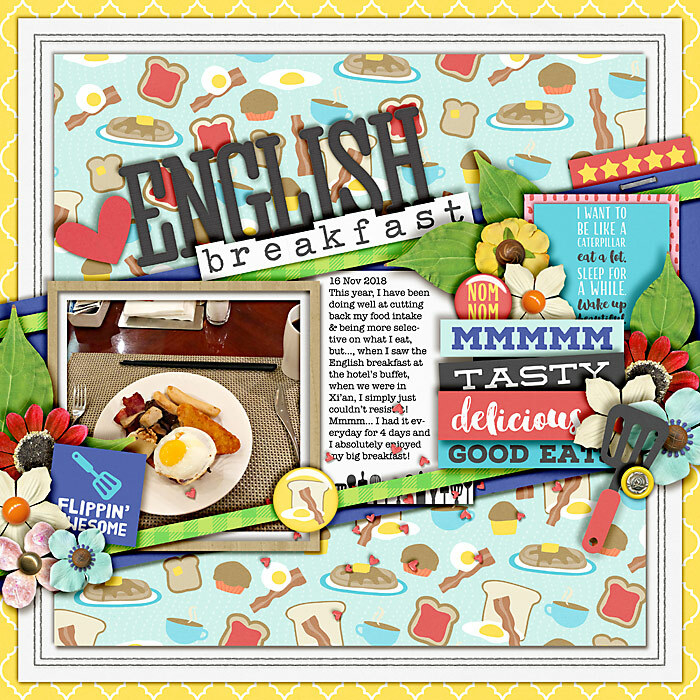 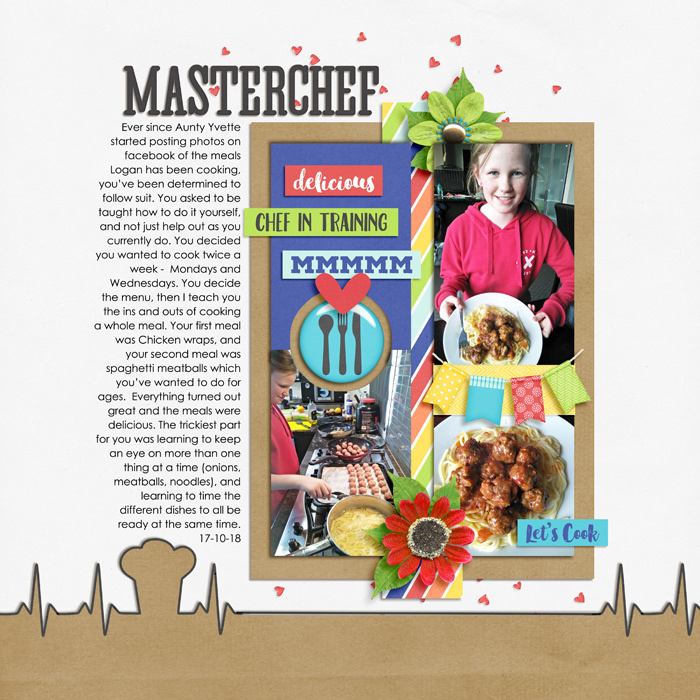 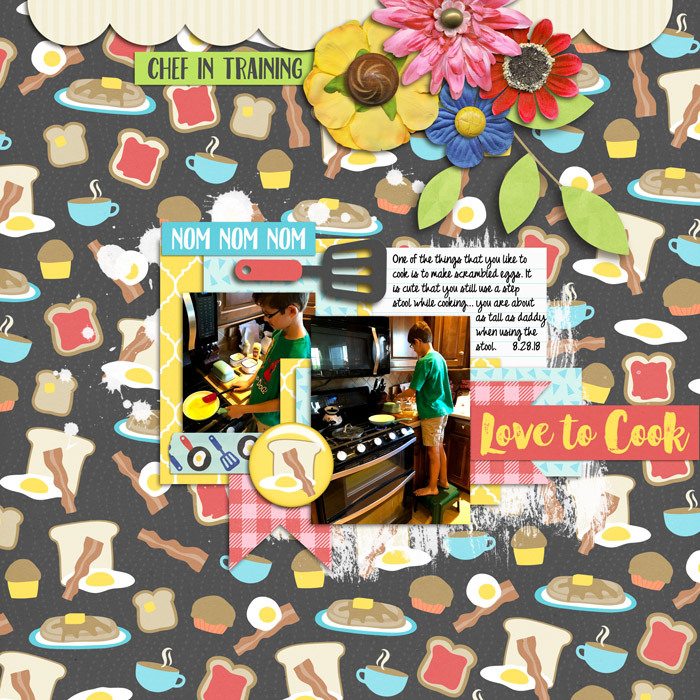 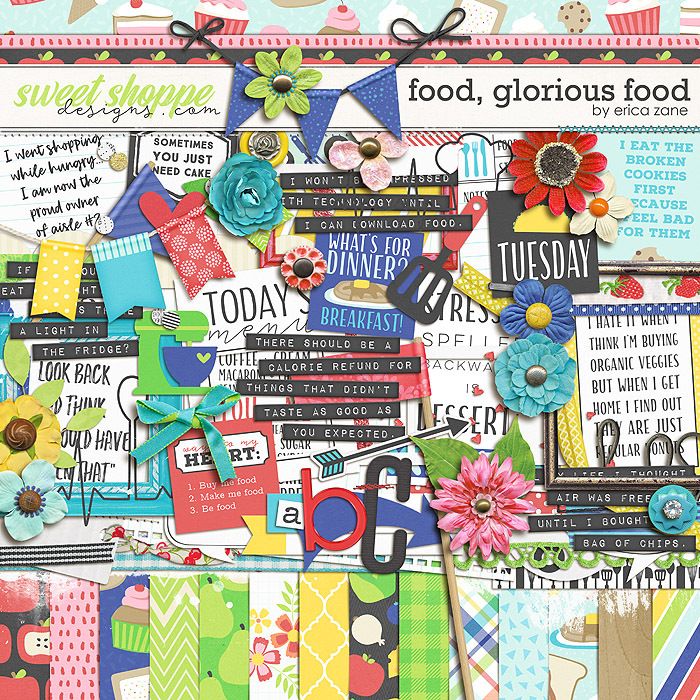 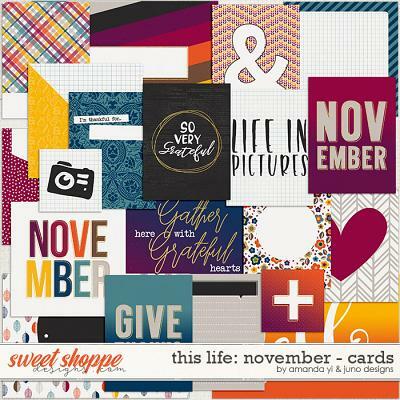 A digital scrapbooking bundle by Erica Zane, Food, Glorious Food is full of goodies to help you scrap your favorite foods...or your not so favorites! 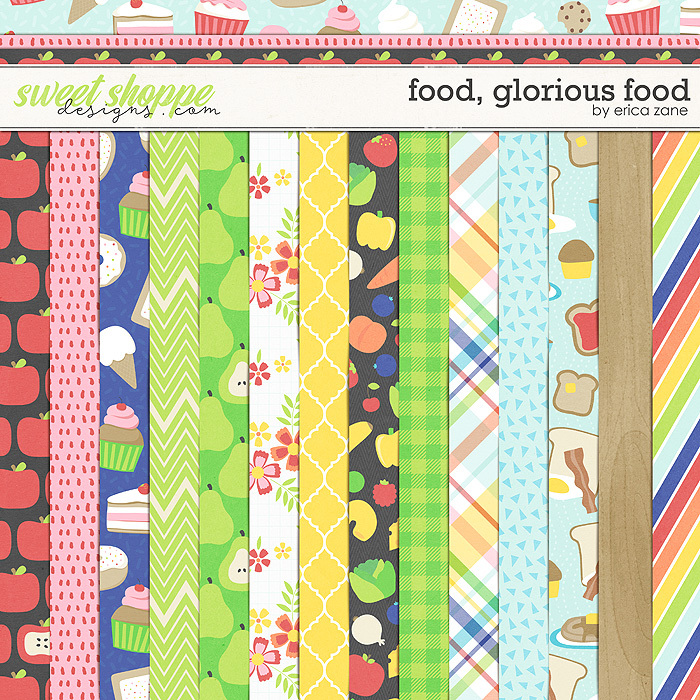 Food, Glorious Food kit: Packed with 28 digital scrapbook papers (33 total), more than 80 digital scrapbook elements and 3 digital scrapbook alphabets (saved as individual .png files). 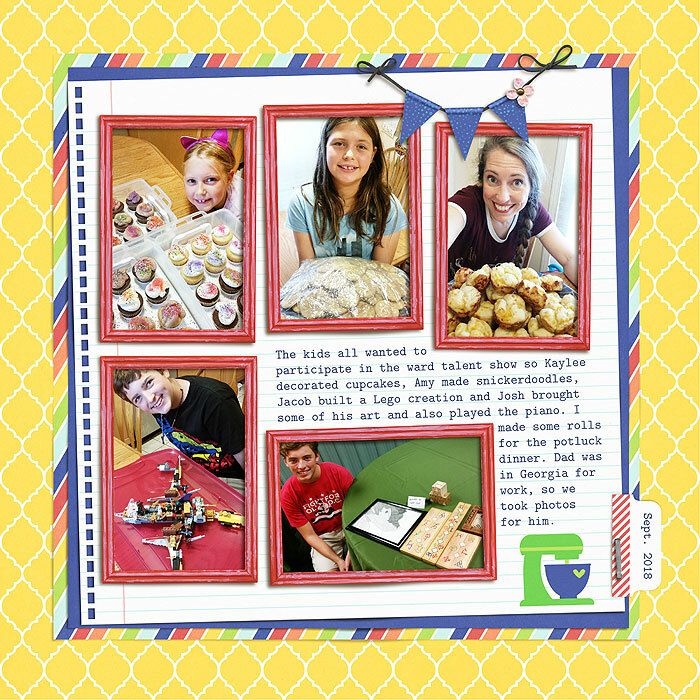 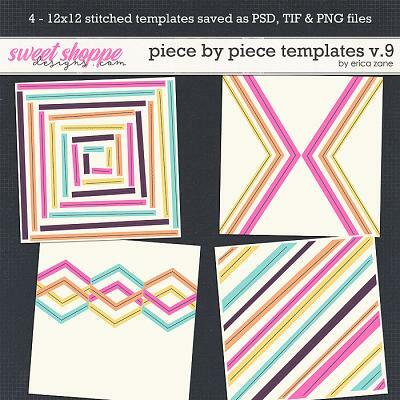 The elements include: banners, arrows, frames, flowers, leaves, word art, chevron, stitches, tape, tags, labels, journal cards, hearts, confetti, ribbons/lace/trim, large mat, speech bubbles, bow, mixers, spatula, flags, paint, tab, buttons, string and a staple. 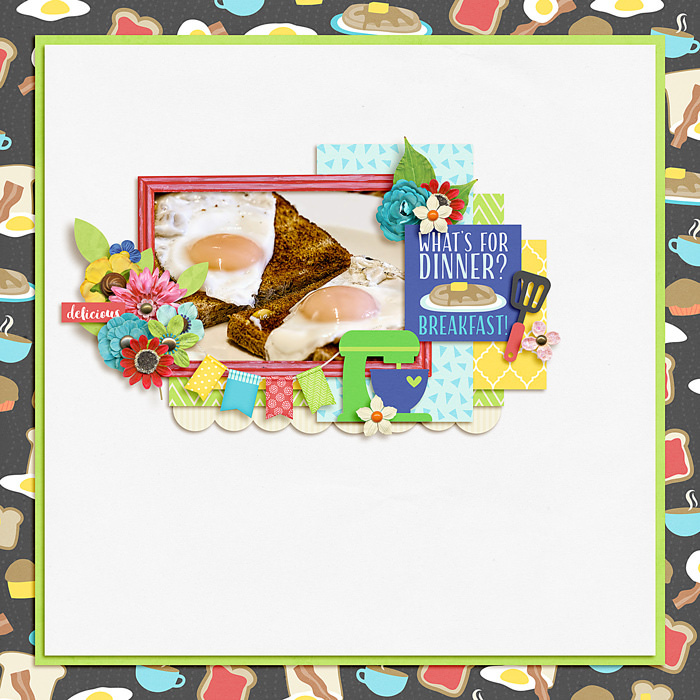 Food, Glorious Food Cards: This add-on to my Food, Glorious Food kit comes with the 12 digital scrapbook 3x4 cards shown above. 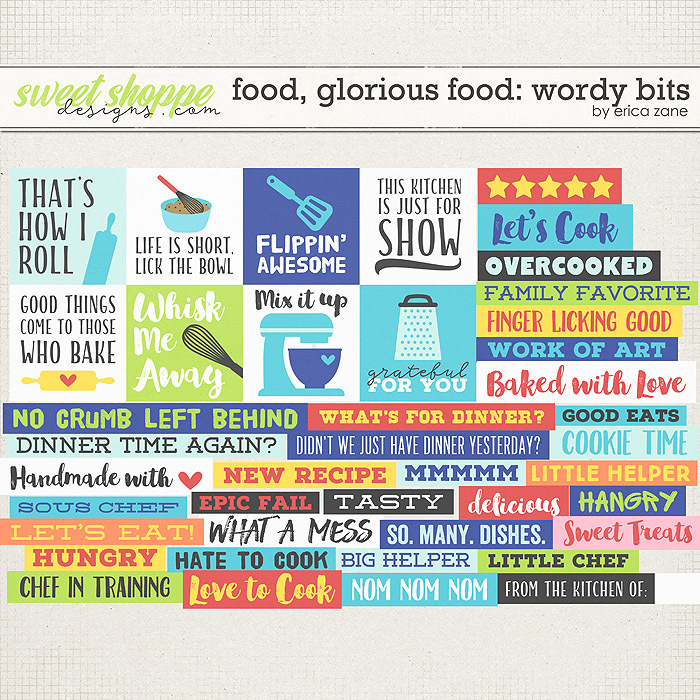 Food, Glorious Food Wordy Bits: (Only available in bundle) This add-on to my Food, Glorious Food kit comes with the 42 pieces of word art shown above. 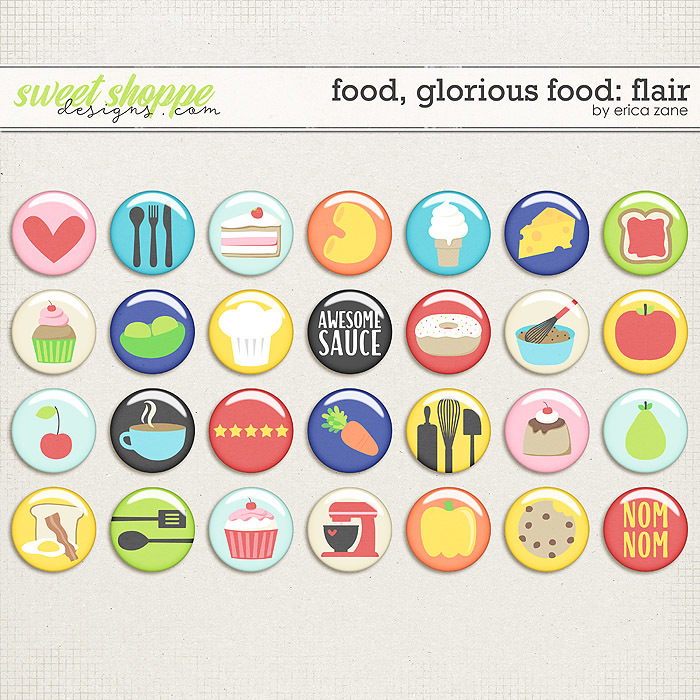 Food, Glorious Food Flair: (Only available in bundle) This add-on to my Food, Glorious Food kit comes with the 28 pieces of flair shown above.